- It’s used for engraving on every type of metal such as gold, silver, copper, stainless steel etc. - It cuts metal material such as gold, silver, copper, brass, aluminum etc. - It carves wax, chemical wood etc. in 3D. - It fastens most material without changing the clamp. - 3D carving of cylindrical wax for ring is supported. - It can engrave on the both inside and outside of ring/bangle. - A inside-ring/bangle tool(L-Tool) is built in. - Bangle engraving is available(Max diameter 93mm). - A larger graphic LCD screen shows machine status and guides machine use. - An RPM controller is equipped for spindle revolution speed change. - It’s compatible with 2D/3D CAD/CAM SW.
with the object shape or size – or depending on the material. - A multi-purpose clamp fastens most materials without changing. - Pin holes on the clamp ensure easier holding of irregularly shaped material. - Gradation on the clamp also helps easier positioning of material on the clamp. - Tool for flat and outside of ring and bangle is built in. - Inside of ring/bangle can be engraved by using its built in L-shaped tool(L-Tool). - Larger graphic LCD screen shows machine status and offers brief guide for the machine use in each step. - A depth regulating nose which ensures constant depth engraving on uneven surface is supported. 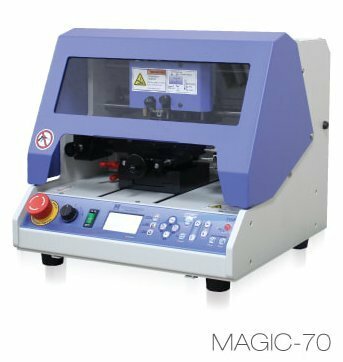 - The back of the machine is open to enable engraving of longer materials. - Its laser pointer points to the area of engraving for easy and errorless positioning. - A 5V external power port is built-in to control various external accessory devices. - A communication port is built-in to communicate with external tablet to engrave without a computer. - Brighter LED light lights the material for user's clear sight. In the box: AC Adapter (24V 2.5A), Power Code, USB Code, Chuck Handle x 2, Chuck Finger (Round1) x 3, Chuck Finger (Round2) x 3, Bangle Adapter x 3, Spanner (6mm), Chuck Finger Skin x 6, T-Wrench (2.5mm), Wrench (1.5mm), AST Tip, Additional Clamp, Pin x 6, Instruction Manual, MagicArt Software. Convert all custom JPEG, GIF, and BMP files with one button ? Generous variety of engraving & cutting options ? Upload your own Vector graphics, templates, and images ? Large choice of creative functions ? Auto serial number generation ?